The Parishioners from Sacred Heart Parish in Rossburn and other parishes of the area together with the local council of the Knights of Columbus have taken on the care of children of at a boarding school in Dubno in the Rivne province in Ukraine. The Ukrainian Catholic Church has dedicated 2017 social charitable service – especially in the context of the Vibrant Parish or Vision 2020 movement. It is in this spirit that the parishioners of the Rossburn district of the Archeparchy of Winnipeg under the leadership of their Parish Priest, Fr. Mykhailo Khomitskyy and together with the Knights of Columbus decided to offer some support to the children that live and learn at the Dubno ‘Internat’ in the north-western province of Rivne in Ukraine. Father Roman Bobesiuk, a priest associated with the Internat, shared the story and explained that the funds forwarded by the Manitobans went immediately to much needed clothing, school note books and pencils, toiletries and, yes, some toys. Besides these everyday necessities, the Knights of Columbus were able to provide the funds to replace fourteen broken washbasins with new stainless steel sinks (see picture). It is not the first time that the parishioners from the Rossburn district helped children in that area to obtain the basic necessities. They engaged in this special charitable project last year as well. 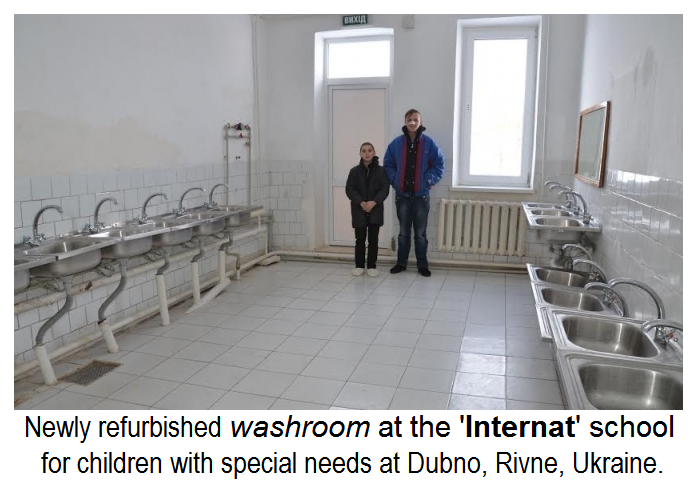 Back then Knights of Columbus also helped replaced corroded plumbing to ensure that clean water was piped into a similar Internat in the village of Myrohoshcha near Dubno.